Bristol Dogs Home says it is facing a re-homing crisis. 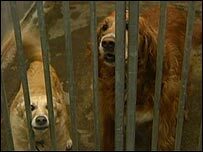 The shelter said it was full, with 100 dogs and more on a waiting list after a large number of strays were brought in, most of which have not been reclaimed. Staff and dogs from the home will be out in the city's Temple Square later appealing for new owners. "We are normally fairly full of dogs but it is unusual to have had so many unclaimed stray dogs coming through our doors," said manager Lyn Gilman. "We desperately need new owners to come forward. We felt we couldn't wait for them to come to us, so we're taking the dogs out to them." She added that the home also had cats, rabbits, ferrets and other small animals in need of new homes.